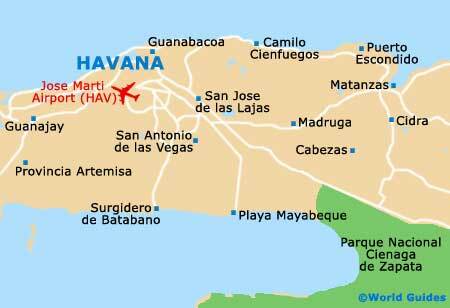 Havana has the default Caribbean tropical climate along with the rest of Cuba. This means that it is warm year-round, and a fair bit warmer than nearby Florida, for example. Cuba has a couple of main seasons - the cool, dry season and the wet season. The nicest weather is, naturally, when it is cooler and drier, which is from December to April. The time to avoid is when it rains most, between May and November. This is when the climate is hotter and more humid, and it also happens to be the hurricane season. To avoid the bulk of the crowds, it is best to try and visit Havana in the springtime or late autumn. The spring is still pleasant and also comes with cheaper hotel rooms. December to February has hot temperatures by day and much cooler air at night. Although this is officially the dry season and is one of the best times to be in Havana, it can rain at any time. The city is also busy over Christmas with tourism. The most reliable weather is without doubt between March and May. It rarely rains at this time and the climate is not overly humid. There is also no risk of hurricanes. July to August are busy months in Havana, as this is when Europeans and Cubans have their school holidays, meaning that beaches and hotels are generally full. The hurricane season officially starts in June / July, with the highest risk of tropical storms being between August and October. Visiting Havana around November time brings a small risk of a hurricane, although this risk really is slight.